Advance in has potential to connect paper to the internet. Researchers in Sweden and the UK have created a printed diode capable of operating above one gigahertz, marking a breakthrough in printed e-label technology and adding to current means of interconnecting objects in an internet-like environment. Heralded as the starting point of having paper connected to the internet, the authors explain that printed electronic labels and stickers are expected to define future outposts of the communication web, as remote sensors, detectors and as surveillance technology, within the “Internet of Things” concept. 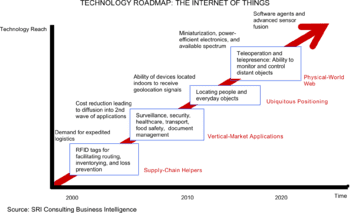 Also known as “ubiquitous computing”, the Internet of Things describes an environment where objects – household appliances, clothing, cars, books, furniture and buildings, just about anything really – process information and network with each other and humans. So your bathroom scales can communicate your health risks to your life insurance company, your car can search for a vacant parking spot, and yoghurt on the brink of expiry will tell your fridge, which in turn will tell you to eat it pronto. That sort of thing. April 17, 2019 - Printed Electronics Market to Garner 11.0% CAGR till 2024, Rising Demand in Healthcare and Automotive to Drive Growth - TMR GlobeNewswireGlobal printed electronics market is estimated to be benefited from the growing trend of minimal material consumption which helps to reduce the cost of printing. April 17, 2019 - Orthogonal Merges OLED Materials And Photolithography Printed Electronics Now MagazineKey opportunities include organic photodetectors for fingerprint sensing, VR and TV displays. April 17, 2019 - NScrypt Secures Patent For Large-Scale Precision Manufacturing Printed Electronics Now MagazineThe patent has 18 claims, 3 of which are independent and 15 are dependent. April 16, 2019 - BatterySense Project For Next-Generation Battery, Sensors Printed Electronics Now MagazineCPI is part of a project focused on next-generation battery and sensor work. April 16, 2019 - ESJET Printing Technology for Large Area Active Devices Awarded Printed Electronics Now MagazineESJET printing is a new printing technology for large-scale, solution-processed displays and enables higher resolution and drop on demand printing.